Common Counselling for IIT's and NIT's from 2015-16 to fill the Vacant Seats for the upcoming academic session 2015-16 as informed by Union HRD Minister to the Rajya Sabha. The issue of seats remaining vacant in IITs and NITs across the country in every academic session was raised by an IIT professor Rajeev Kumar in 2010 through public interest litigation. He was of the view that there are many irregularities in the joint entrance examination conducted by IITs. She also said that the technical committee which was constituted to sort out the process flow differences between IITs and NITs counselling has together come out with a decision for joint seat allocation process which is expected to begin from the academic year 2015-16. 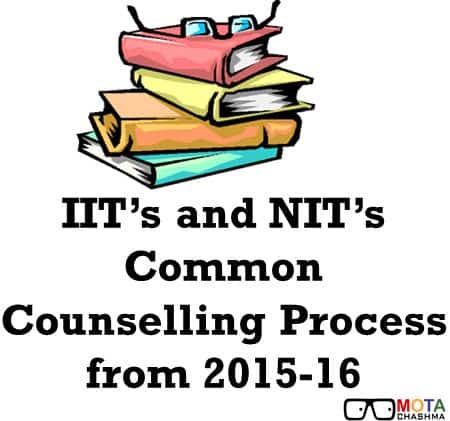 The government had took the decision of Common Counselling process for IITs and NITs to avoid cases where a candidate reserves a seat in IIT and NIT simultaneously and leaves one of the seats once the admission process gets over. Due to which the seats remain vacant either in IIT or NIT. At present in India there are 16 Indian Institutes of Technology (IITs) and 30 National Institutes of Technology (NITs). Admission process of Indian Institutes of Technology is divided into two stages. Stage 1: Candidates have to appear in JEE Main, which is a common entrance exam conducted for admission to Undergraduate Engineering Program offered by all NITs and CFTIs. Stage 2: Only the top 1,50,000 candidates (including all categories) are eligible to appear in JEE Advanced. JEE Advanced is conducted for admission into 16 IITs and ISM Dhanbad Admission.